During a walk through an Atlanta park 4 years ago, Robert Kennedy caught site of a blue towel that appeared to be covering something. What the 60-year-old man found under the towel, changed his life forever. Murphy is now doing great! Barely alive and severely beaten, a 9-year-old Australian Shepard mix, was shivering underneath the towel. Kennedy scooped up the poor animal and brought him to the closest veterinarian's office and urged him to do whatever he could to save the dog. Stephen Pope, the medical director at VCA Pets Are People Too in Dunwoody, described the dog as thin, clearly in shock from the trauma, and unresponsive. Murphy, as the dog became known as, was immediately rushed into surgery to repair his severely damaged skull and jaw and to remove his damaged left eye. He was then placed on a variety of medications and placed under careful watch while he recuperated. 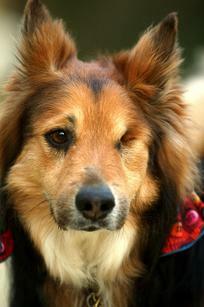 The dog not only recovered, he was a medical marvel to those who knew his plight. Murphy was sent home on just the eighth day of his stay at the vet. Luckily, Murphy suffers from no serious neurological damage following his beating. The veterinarian states that much of Murphy's recovery has to do with the $10,000 worth of care and twice-daily visits from Mr. Kennedy. This caring man has truly brought out the best in a dog who truly deserved love. Kennedy also treated Murphy for other lingering health problems, such as being underweight and battling a skin condition. Under Kennedy’s care, Murphy has plumped up from 38 pounds to a healthy 53 pounds. His once-bald tail and patchy fur now gleam from daily fish oil treatments and regular brushing. The caring man was overwhelmed by how many people responded to Murphy’s case. He set up a trust fund for the dog’s care after offers to help poured in from 30 states, Puerto Rico and Canada. He raised $38,000 — money that will last throughout Murphy’s life and then go to nonprofit pet rescue groups. But Kennedy isn't doing any of this for attention. After setting up the trust fund, he has rejected numerous offers from TV stations and shows, including the "Ellen DeGeneres show." An investigation proved that Atlanta resident, Joe Waters, decided to bash his dog, then named Austin, twice in the head with a sledgehammer and then abandon him in the park. The jury convicted Waters of a felony and two misdemeanors in what he described as a mercy attack when he mistakenly thought his pet had been poisoned. Just moments before the judge sentenced Waters to one year in jail, a prosecutor presented Kennedy with notarized papers. Murphy was now officially his!